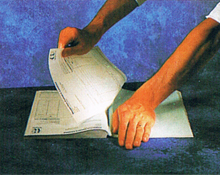 Howarleim III is designed for pads where there is the requirement to tear out pages from the middle of a pad, rather than just the top, (as in the case of normal telephone pads when Padset or Dryflex can be used). Prior to the invention of Howarleim III the only way of guaranteeing sheets to be pulled out from the middle of a pad, and the remainder of the pad to stay bound together, would have been to perforate the sheets. This is costly in terms of materials and time, particularly press time. 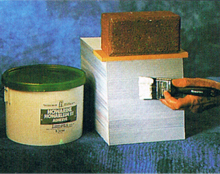 With Howarleim III all that is required is to stack the collated pages, apply the adhesive, and wait to dry – providing tear out copy books without the need to perforate. Howarleim III is available in 2.5 litre and 5 litre containers direct from Howarine or through our distributor network.